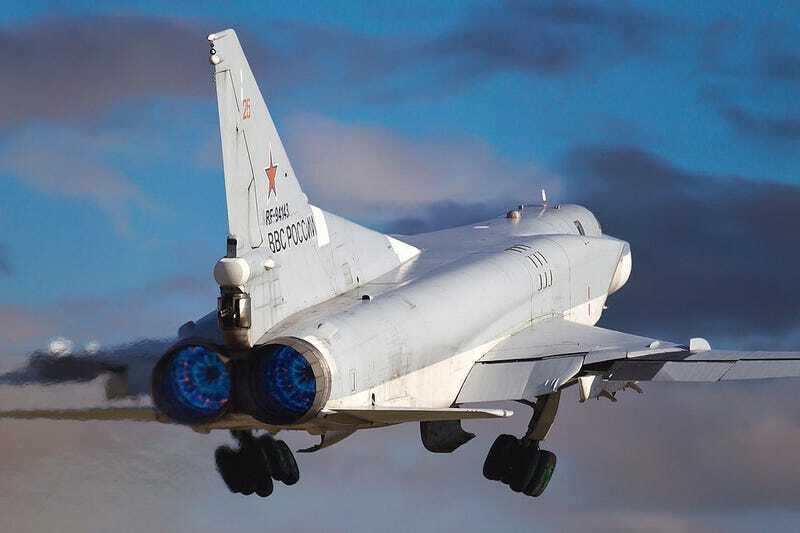 Once again, Russia has upped the air combat capability ante on the Crimean Peninsula with Tu-22M3 Backfires reportedly deploying there as part of widespread 'snap' readiness drills among Russian forces. This marks the first time a Russian strategic asset like the Tu-22 has operated from Crimea since the territory was annexed last winter. Sending the Tu-22M3s to Crimea is said to be part of a large number of drills running all over Russia, including large ground combat drills in the Russia's western military district, cooperative tactical drills with Serbia, surface action exercises with the Northern Fleet, as well as smaller drills in Russia's eastern military district. These short notice deployments and excesses are meant to prove the readiness states of key areas of Russia's military apparatus, and in doing so they also work to send a message to Russia's increasingly concerned western neighbors. Speculation as to what exactly that message is depends on who you ask. The Tu-22M3's high approach speed, along with the Kh-15's very high terminal attack speed and standoff range make the pair extremely dangerous for ships operating in confined waters, not far from territory where the Tu-22M3 could emerge from. Thus the Black Sea is the Tu-22M3's ideal hunting grounds. For longer-ranged strikes, the Tu-22M3's can employ the larger Kh-22, NATO name "Kitchen," anti-ship cruise missile that still offers terminal speeds of over mach four and a range of around double that of the Kh-15. The Tu-22M3 can carry three of these massive "aircraft carrier-killers." The sudden 'snap' deployment of the Backfires to Crimea may be a response to the small armada of NATO ships that are currently plowing the Black Sea, which includes the flagship of the pocket flotilla, the Ticonderoga Class guided missile cruiser USS Vicksburg (CG 69), HMCS Fredericton (FFH 337), TCG Turgutreis (F 241), FGS Spessart (A 1442), ITS Aliseo (F 574) and ROS Regina Maria (F 222). Although the Tu-22M3s deployment to Crimea certainly is a major upgrade in anti-ship and long-range strike capability for region, and the aircraft are near perfectly suited for attacking ships in the confines of the Black Sea, Russia already has an astounding, bordering on dizzying array of anti-ship missile platforms in Crimea. With all this in mind, the ability for the Backfires to reach out and strike surface targets with great speed and violence of action, virtually anywhere in the Black Sea, and even while still flying over Crimea's territorial waters, represents a credible threat to say the least, and a capability that Russia's standing contingent of Su-24s, Su-27s and Su-30s based on the Peninsula cannot compete with. The bottom line is that 'Fortress Crimea" now features strategic bombers, news that may have been inevitable but is still undoubtedly disturbing to Crimea's NATO neighbors and to NATO ships churning through the waters of the Black Sea. Over the last year Russian attack aircraft and fighters have made bold mock attack runs at NATO ships operating in the western Black Sea, now we will have to wait and see if the big, intimidating, swing-wing Backfires come out to give the current US led flotilla a hard time. Ukraine Update #4: Are Russia And Ukraine Already At War? CLARIFICATION: Headline tweaked to indicate that the planes, while reportedly set to deploy, may have not arrived yet.